When Glee, the show with barbed wire wit and snappy music numbers, and Chuck, the action-packed spy thriller/comedy with an endearing romantic angle, both encountered cruel and unusual hiatuses, the world went into shock. This shock kept building and building until the beginnings of the apocalypse showed themselves as the world began to fray. Last week, I sat in The Nearby Future’s conference room, pitching this theory to our new contributor Sarah, and our notoriously lazy writer, Calister F. Wells. I lowered the lights, walking dramatically in through the back of the room as the powerpoint began. 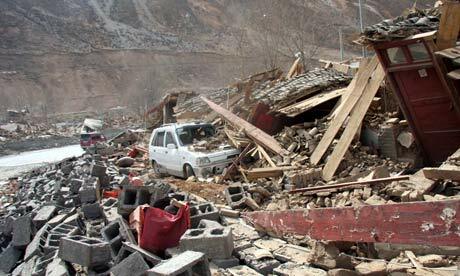 “Earthquake in Yushu, Qinghai province. 100,000 will have to be relocated. 9,900 injured, dead and missing. In New York hospitals, there has been over 50 nurses strikes. The mortality rate in those hospitals during each strike is bumped up by about 20%, or 140 deaths. Icelandic Volcanoes delay flights. All of these disasters have occurred in the past month. Do you know why?” I ask. “All of this is a precursor to a full-out world war?” Calister asks, almost hopefully. “True. It’s so cheesy it’s entertaining,” Sarah says cheerfully. “What does this have to do with worldwide disaster?” Calister asks, doubtfully as he takes a sip of coffee from his Nerd Herd mug. purchase discount medication! generic zoloft and weight loss . express delivery, generic . Chuck: Sarah, I need to tell you something. cipro and flagyl Sarah: What is it, Chuck? buy online australia discounts. men’s health. cheap prices , cholesterol, moneyback policy. Chuck: We’re on hiatus. Sarah: It means the possible end of everything we care about. Like each other. australia. lowest prices and satisfaction guaranteed! Chuck: And the world. cost of zyban and chantix Chuck: Do you know what this means for us? Chuck: War against NBC. Are you in? And as Calister argued that it was just coincidence and Sarah just smiled and shook her head, I realized that I was on to something here. NBC, if you’re reading this, you better greenlight Chuck’s season 4. Nobody likes Heroes anyways. You’ve got bigger things to worry about. Like the world. And saving it. Y’know, what Chuck does in his sleep?